When people think of Argentina and traditional dancing, the first thing that comes to mind is probably Tango; however, over the vast country many different folkloric dances are practiced, the Malambo being one of the most stunning. This typical dance which originated in the Pampean region is carried out by men who display their ability through their footwork and their skill with knives and boleadoras (a kind of sling used by the Patagonia natives and gauchos). The rhythmic music is usually played with a type of drum called Bombo Leguero and a guitar, although instruments vary depending on the area of the country. 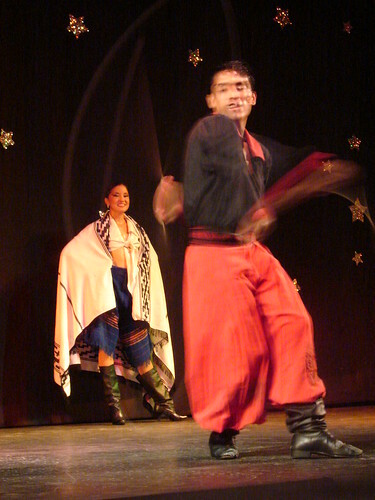 Malambo shows in Buenos Aires are sometimes put on at the Feria de Mataderos , at tango venues and at estancias such as Estancia Santa Susana. This entry was posted in Argentine Culture, Off the Beaten Path and tagged argentina, boleadoras, buenos aires,, Dancing, drums, exotic, folklore, Gauchos, knives, Malambo, traditions, Travel by Fierro Hotel Staff. Bookmark the permalink.